Blagojevich appeal filed July 15, 2013, Attorney Len Goodman, Lauren Kaeseberg, Judge James Zagel barred FBI wiretap evidence, Juror bias, Why was appeal delayed? “I can tell you that, based on court rules and procedures, Judge James Zagel carries some of the blame for the delay in the transcripts. From The Oakland Press July 16, 2013. The lengthy filing with the 7th U.S. Circuit Court of Appeals in Chicago comes more than two years after the Chicago Democrat’s retrial and 16 months after he entered a federal prison in Colorado. Jurors convicted Blagojevich, 56, of engaging in wide-ranging corruption, including that the two-term governor sought to profit from his power to appoint someone to the U.S. Senate seat that Barack Obama vacated to become president. The appeal cites a juror who allegedly expressed a bias against Blagojevich who was seated despite the objections of defense attorneys. It also raises longstanding claims that Judge James Zagel barred FBI wiretap evidence that might have aided the defense and argues the judge miscalculated the appropriate prison term. The appeal was filed about 30 minutes before a midnight deadline to do so. In June, Blagojevich’s attorneys requested permission to file a longer-than-usual appeal, noting the trial produced 12,000 pages of transcripts. “The issues for appeal are numerous and complicated,” they wrote. The court agreed to let them file the equivalent of about 100 pages, which is what they did. Blagojevich was convicted on 18 counts over two trials, jurors in the first deadlocking on all but one count. Taking the stand in the second, decisive trial in 2011, Blagojevich insisted his talking about wanting to sell Obama’s seat was just that — talk. Tagged 2013, Attorney Len Goodman, Blagojevich appeal filed July 15, Judge James Zagel barred FBI wiretap evidence, Juror bias, Lauren Kaeseberg, Why was appeal delayed? From CNN July 13, 2013. “George Zimmerman never denied shooting Trayvon Martin, but he said he did so in self defense. Late Saturday night, a Florida jury found him not guilty in the teenager’s death. The six jurors — all of them women — deliberated for 16½ hours. Five of the women are white; one is a minority. “The jury had three choices: to find Zimmerman guilty of second-degree murder; to find him guilty of a lesser charge of manslaughter; or to find him not guilty. What led jurors to this verdict? From retired Lt. Col. Donald Sullivan July 10, 2013. “You all remember my ranting about the improper jurors’ oaths in NC, the fifty States and the United States. I brought the issue up with Senator Thom Goolsby last year. He got excited about it and said he would be sure it was addressed the next session of the General Assembly which just happened to be this past spring. He did as he said he would do, and the results are attached. It’s time to celebrate this major victory!! Senate Bill 528 is no doubt the most important piece of legislation passed this session, and nothing was said about it. I only found out today!!! AN ACT TO CLARIFY THAT PETIT JURORS ARE REQUIRED TO TAKE THE OATH SET FORTH IN THE NORTH CAROLINA CONSTITUTION AND TO PROVIDE CONSISTENCY BETWEEN THE STATUTES SETTING FORTH THE OATHS TO BE TAKEN BY PETIT JURORS. “§ 9-14. Jury sworn; judge decides competency. “§ 11-11. Oaths of sundry persons; forms. You do solemnly swear (affirm) that you will truthfully and without prejudice or partiality try all issues in civil or criminal actions that come before you and give true verdicts according to the evidence, so help you, God. taken on or after that date. An email from Mr. Sullivan June 16, 2013. When I started out in 1999 to learn about how the Godforsaken government works in the United States, I sincerely believed in the separation of powers and that I could get at least one of the three branches of government to see the light and right the wrongs that were being perpetrated against me in the interest of the “public safety” and the “general welfare”. I believed that I had rights, and I could use those rights to convince the government and its “myriad of offices” and “swarms of agents” to leave me alone. I was wrong. I first tried to influence my elected “representatives” in the legislative branch by informing and educating them on the threat we faced regarding our lost rights and how the laws were being improperly enforced by the executive and judicial branches. This effort fell on deaf ears. I have since rescinded my voter registration in full understanding of the uselessness of trying to right the wrongs by the ballot box and recognizing that there is no “right to vote”. I then worked with the executive branch thru the governor, the Attorney General, local and State law enforcement, the district attorney (a curious mixture of the executive and judicial branches) and the Sheriff to help them understand how the law was being improperly enforced against us with the sole intent of abusing and eliminating our protected rights. In this endeavor, I often placed myself in harm’s way by getting ticketed, arrested and worse as a means of getting my message out. Another failure. That led, of course, to the judicial branch, which I absolutely believed would do its duty to protect and maintain the law and my rights under the law. As reported previously, I was totally disappointed, but along the way learned about the “judicial conspiracy” to prolong and encourage the insidious and incremental destruction of our protected rights. Judges are, after all, employees of the state. Thus, anytime the state is a party to a case, judges have a conflict of interest which cannot be denied; and they will nearly always defer to the state. There will be no impartiality on the part of the judiciary, and we can’t get a fair trial. This conspiracy is nowhere more obvious than in the matters of revenue. He was right. Since then, the courts have ruled that the 16th Amendment was properly ratified when the evidence, which was not allowed to be presented, indicated the exact opposite. This phenomenon is known as “legal memory”, or the “everybody knows” syndrome. Like the way IRS itself was apparently created, or at least validated, by the courts: “We can all agree the Department of the Treasury is created at 31 U.S.C. Section 301(a) by Congress” (See Hoodenpyle, 461 Fed. Appx. at 682). The Tenth Circuit went on to say that “the IRS is an agency of the United States” as a matter of well settled law, citing 5 U.S.C. Section 101; but the words “Internal Revenue Service” do not appear at Section 101. It is true the Department of Treasury is listed at Section 101. But the IRS is not. This “attitude adjustment” is continuing today. It is mentioned in the IRS’ System of Records, specifically in their “Case Management and Time Reporting System, Criminal Investigation Division” – Treasury/IRS 46.002, which can be found in the Federal Register by searching the Privacy Act Issuances Compilation for the Treasury/IRS, available on line through the Office of the Federal Register, National Archives and Records Administration, Washington D.C. 20408. Though truthful, Judge Wyzanski may have been a bit naïve. He was obviously not aware that this was not just a casual happening on the part of the IRS. And neither was he aware of the federal judges like Judge Harry Claiborne in Nevada, who dared to cross the IRS, was prosecuted and jailed; or Judge Walter Nixon in Mississippi, who was prosecuted for perjury, but had acted as an IRS pimp and was not jailed; or Judge Alcee Hastings of Florida who, having a habit of coming in conflict with the IRS and the powers that be, was prosecuted and found innocent, but later impeached by Congress. We now know that judges cannot be impartial in an income tax case or any case where the IRS is a party. Knowing this, we can and should demand recusal of any judge who files and pays income tax, because he cannot be impartial, if for no other reason than the attitude that, “If I have to file and pay income tax, so do you.” In the case of a judge who, for whatever reason, does not pay income tax, challenge him on whether the IRS has compromising information on him. Blagojevich appeal opening brief April 25, 2013, Or more delays?, Attorneys Goodman and Kaeseberg, What were Obama and Blagojevich discussing in 2008? Barack Obama has been protected from the beginning of the prosecution in “Operation Board Games” involving a host of Obama Chicago corruption cronies such as Tony Rezko, Stuart Levine and of course Rod Blagojevich. From FBI wiretaps of Blagojevich on November 12, 2008. 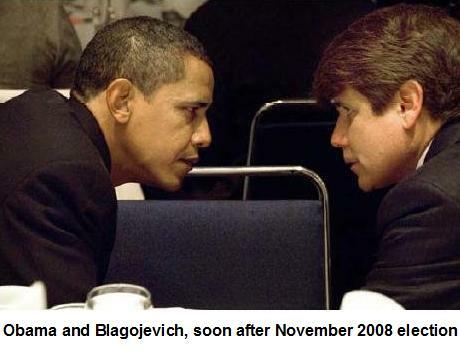 What were Obama and Blagojevich discussing just after the 2008 election? From Politico March 15, 2013. “And next up for the former governor, Goodman said, is his case on appeal in the 7th Circuit. Blagojevich’s opening brief is due April 25, Goodman noted. From Chicago CBS local September 14, 2012. “Attorneys in the first trial of former Gov. Rod Blagojevich still keep in touch with him, and think his sentence will be reversed on appeal if the case ever gets there. As WBBM Newsradio’s Alex Degman reports, the team of Sam Adam Jr. and his father, Sam Adam Sr., say the Blagojevich appeal is taking forever to get to court. Adam Sr. says there is a good chance the former governor will be freed if all the evidence is presented. Tagged 2013, Attorneys Goodman and Kaeseberg, Blagojevich appeal opening brief April 25, Or more delays?, What were Obama and Blagojevich discussing in 2008? “In 2002, the year after Obama made the pitch, the Illinois Teacher Retirement System reported an 18% increase in assets managed by minority-owned firms. Ariel’s share grew to $442 million by 2005. William Cellini, who was convicted of 2 counts of conspiracy to commit extortion and aiding and abetting the solicitation of a bribe on November 1, 2011, and was sentenced to one year and one day in prison, has a motion hearing today, December 4, 2012 in the courtroom of Judge James Zagel. From the Chicago Tribune October 19, 2012. “William Cellini, the once-powerful Springfield fundraiser and lobbyist, asked a federal judge Thursday to allow him to remain free on bond pending his appeal on a public corruption conviction, claiming that a juror who withheld her felony background from the court raises “unprecedented” legal questions. Cellini was among the last of more than a dozen political insiders to be convicted in the federal Operation Board Games probe that also snared former Gov. Rod Blagojevich. He is scheduled to report to federal prison in January to serve one year and one day for his role in a plot to extort campaign contributions for Blagojevich from a Hollywood producer seeking to retain his lucrative state business. In a filing to U.S. District Judge James Zagel, Cellini’s lawyers argued that he has a strong case for appeal, highlighting the legal issues raised after the Tribune revealed following the verdict that juror Candy Chiles had withheld disclosure of felony convictions during jury selection. The questions raised are so “substantial” that Zagel should release Cellini during the appeal, in part because he could complete his prison sentence before a higher court could act on the legal issues, the motion says. Three weeks after Cellini was convicted, the Tribune reported that Chiles did not disclose a 2000 felony drug conviction and a 2008 felony DUI conviction on a jury form and when Zagel questioned her in the courtroom. Cellini’s lawyers sought a new trial, arguing that Chiles lied and that if they had known of her felony background they could have tried to remove her from the jury. They also argued that her felony background should have barred her from jury service. After a contentious hearing in which a defiant Chiles testified, Zagel denied a new trial, saying she had not deliberately lied and that her failure to disclose her criminal background did not taint Cellini’s 2011 trial. Zagel also dismissed the defense argument that she was not eligible to serve as a convicted felon. But in his filing Thursday, Cellini argued that the legal questions could earn a reversal from the 7th Circuit U.S. Court of Appeals. “The Court’s decision turned on numerous difficult, hotly contested legal and factual questions that were very close and could be decided the other way — and there is no doubt that if Cellini prevails on that issue on appeal, he will be entitled to a new trial,” Cellini’s lawyers wrote. From Citizen Wells January 5, 2012. “Capri Capital is a little more interesting. schemes at the Teacher’s Retirement System. It is going to be a busy court week for Barack Obama. One of his corruption cronies, William Cellini, has a hearing today for a ruling on a possible retrial. Judge James Zagel may make that ruling today. Tomorrow, January 25, 2012, Stuart Levine and Steven Loren have a status hearing in the courtroom of Judge Amy J. St. Eve. And conspicuously absent from the courtroom is Daniel Frawley, ex partner of Tony Rezko. Frawley’s sentencing has been repeatedly delayed. Daniel Frawley linked a payment from Tony Rezko to Barack Obama in a deposition. And of course, Obama has a court date on January 26, 2012 in GA regarding his eligibility to be on the Georgia ballot and his Natural Born Citizen Status. Stuart Levine knows almost as much about Obama ties to corruption as Tony Rezko.